Forget all that stuff about the fruit cup or the salad that landed on the menu. It masks a 30-year trend of fast food meals overall getting worse, not better. They’ve gotten more bigger, more fattening and saltier. That’s the conclusion of research published recently by Boston and Tufts universities in The Journal of the Academy of Nutrition and Dietetics. The study looked at 30 years of fast food menus at restaurants such as McDonald’s, Dairy Queen and KFC. Between 1986 and 2016, deserts grew by 62 calories per decade; entrees gained 30 calories per decade; and sodium grew as well each decade — 4.6 percent for entrees, 3.9 percent for sides and 1.2 percent for deserts. 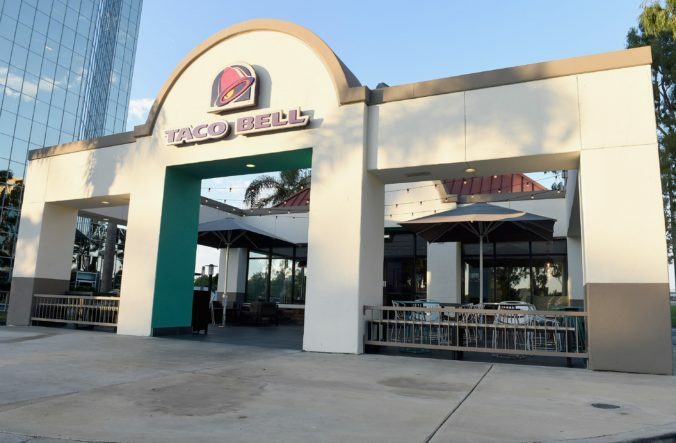 With about 37 percent of U.S. adults consuming some fast food every single day, according to the National Center for Health Statistics, it’s not what you’d call good news. 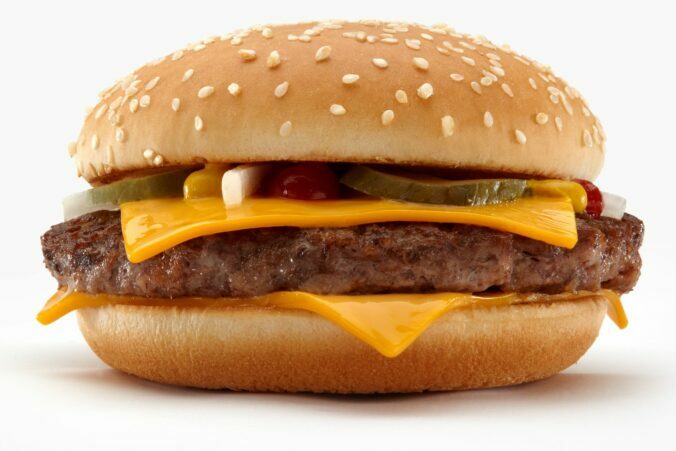 Fast food has been implicated in rising rates of obesity, diabetes and heart disease. Can a person watching his weight eat at these restaurants that the foodies are honoring? 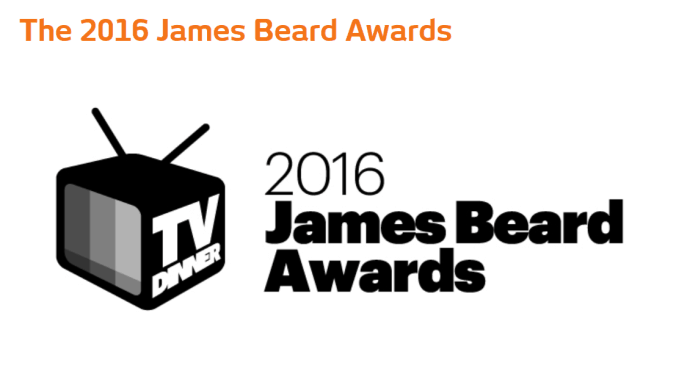 The James Beard Awards have become the Oscars of the restaurant world in the 30 years the foodie world has doled them out. Atlanta typically fares pretty good — at least in the nominations phase. This year is no exception. Staplehouse in Atlanta’s Old Fourth Ward was nominated for Best New Restaurant. I’ve eaten there, although not for a regular review. 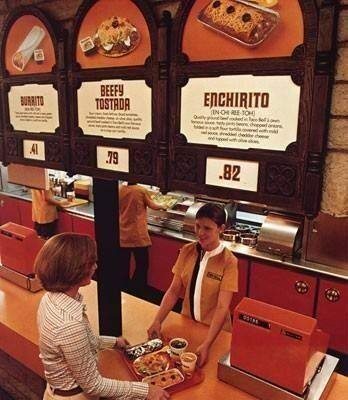 I was with friends who did all the paying and ordering. It was amazingly well-cooked food, and some of it was healthy if not quite low fat . For example, a dish of roasted mushrooms, farro piccolo, sunflower and egg was earthy and filling in that way that whole grains are. (A half cup of uncooked farro is 170 calories, 1.5 grams of fat and 6 of protein.) But it managed to taste rich and decadent at the same time, thanks to the oozy egg. Our table liked it so much that the host ordered a second. It is still on the constantly changing menu. Most of the rest of what we consumed that night is not, but it was all good. Robert Alexander of The General Muir was nominated for baking. 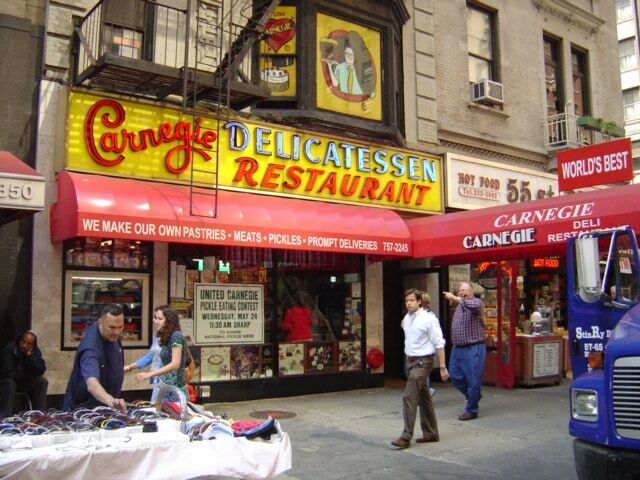 On my one visit, the bread was great — especially on the best corned beef or Reuben sandwich in the city. 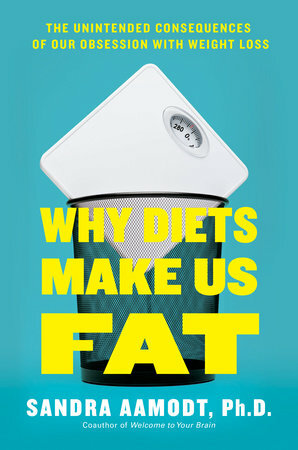 Diet? Who knows? Bacchanalia got a nod for best service, and that certainly was my experience there. Among those mentioned for Best Chef: Southeast was Kevin Gillespie of Gunshow. His food is great, but it was hell on the diet because it’s hard to order carefully. Dishes come out of the kitchen and are offered to diners in the style of Chinese dim sum. Also mentioned for Best Chef: Southeast was Billy Allin of Cakes & Ale in Decatur. I found the kitchen unhelpful with special requests, but that was 2011. Perhaps things have changed. The nominees will be narrowed to finalists March 15 with winners announced May 2, according to ajc.com. 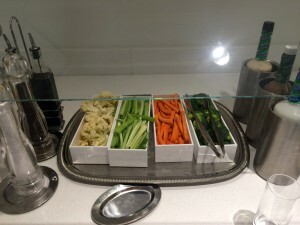 Yes, you can eat healthily at the Delta Sky Club. Here’s how. 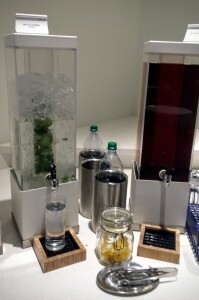 Finally, something to drink: mint-cucumber water and unsweetened ice tea. In my fantasy, a new branch of the Transportation Security Administration has taken over at U.S. airports. Instead of screening for terrorists, it screens for the kind of awful food that repels most people and makes dieters fat. 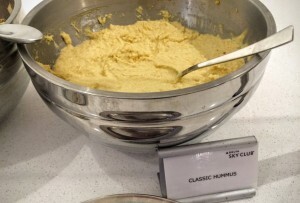 Alas, Delta Airlines is subject to no such screening in real life, so the food at its many Sky Clubs is a mixed bag. 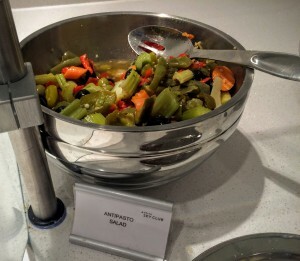 The menu has undergone some experimentation in the last year or so, and more healthy choices have been added. I can remember a time when it was pretty much cocktails, beer and wine, soda, salty snacks and cookies. 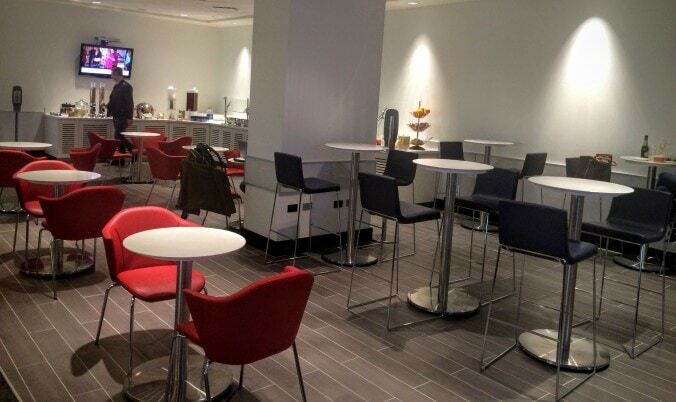 The most recent visit took me to the Sky Club on Concourse T of Atlanta’s Hartsfield-Jackson International Airport for an evening flight. The club had recently been renovated. One area had been renovated to look like a little cafe with a buffet. Cucumber and mint water and unsweetened ice tea. So many people have given up any soda, so this is a great addition. The vegetables in this antipasto salad are sitting in a thick coating of fat. The soups. Like most commercial soups, they are salty and set that salt craving binge in motion. One bowl and you’re binging the rest of the night. 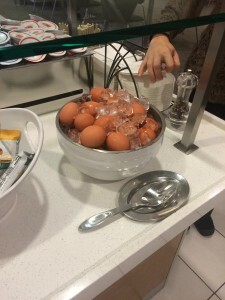 At breakfast, there are now hard-cooked eggs (though strangely perfectly formed and kind of tasteless), better-tasting yogurt and a citrus salad besides the huge, bready and nutritionally vapid bagels. Hat’s off to Delta for all the changes. 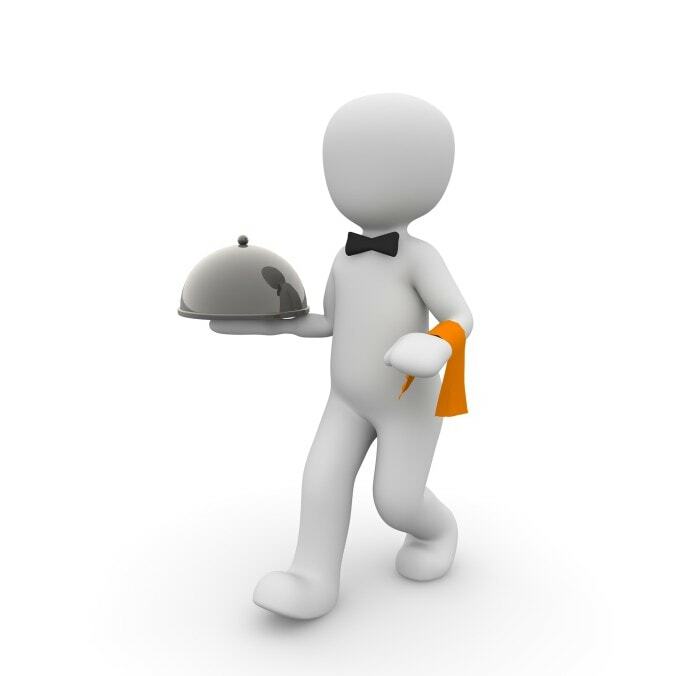 A helpful server is the best friend a person watching his weight can have. When you’re trying to lose weight and eat out a lot, there’s no better friend or foe than the server. He or she can make sure that your requests are relayed to the kitchen and honored. 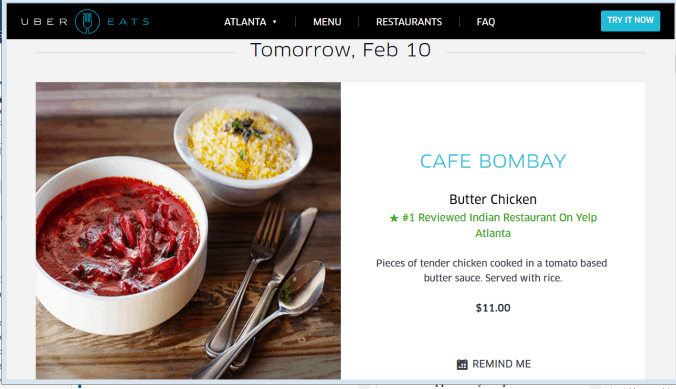 The Atlanta Journal-Constitution did an informal survey asking how much people tip. About 550 people voted, with 253 saying 18-20 percent; and 158 saying 20-25 percent. The Restaurant Dieter is willing to bet that the higher tippers include folks who rely on servers to have their backs. Like the excellent server below. 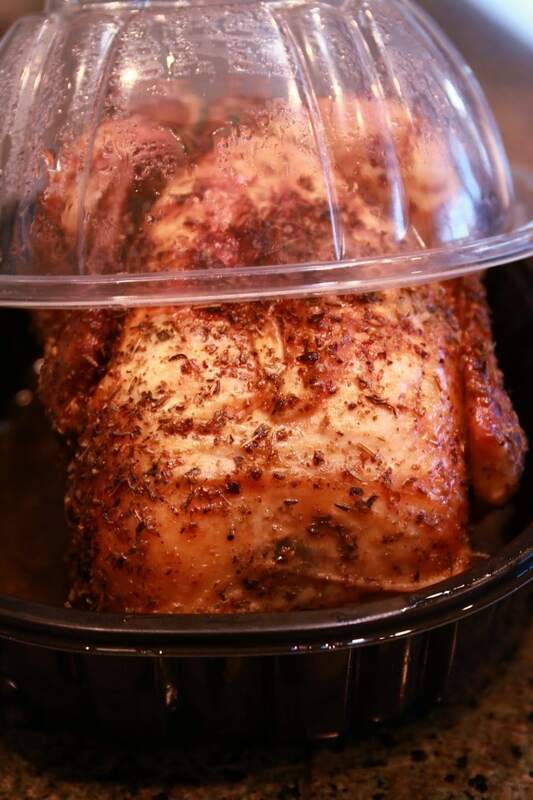 Consumer Reports: What’s under the plastic wrap at your grocery store? It’s not always fresh and unprocessed as you might assume. It can be salty. Whole Foods’ breaded tilapia has 612 mg of sodium, vs. 733 at Red Lobster and only 420 for Mrs. Paul’s in the frozen aisle. There is no nutritional information on the labels, because the Food & Drug Administration doesn’t require it for fresh prepared foods. There is no information about portion control. With all the great tips for portion sizing suggested by Weight Watchers, this may not matter as much to some. You can support ConsumerReports.org by joining. It’s a mere $35 a year right now and there is information about food online and in every issue of the magazine.